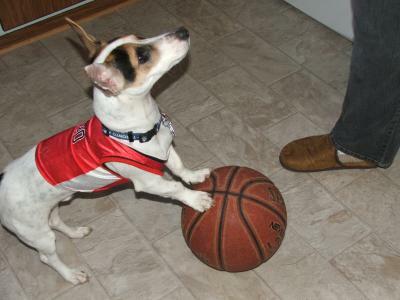 My JRT, Ryder loves to play basketball with my son, Kyle. I got him a basketball Jersey to play in. Here's a picture of him sporting his Jersey and stealing the ball! He just wants to be like his brothers when he grows up! I wonder who has the most fun. Ryder or Kyle. Love the jersey. It does look as if the dog is looking up at someone just waiting to play! Join in and write your own page! It's easy to do. How? Simply click here to return to Pet Photo Contest.